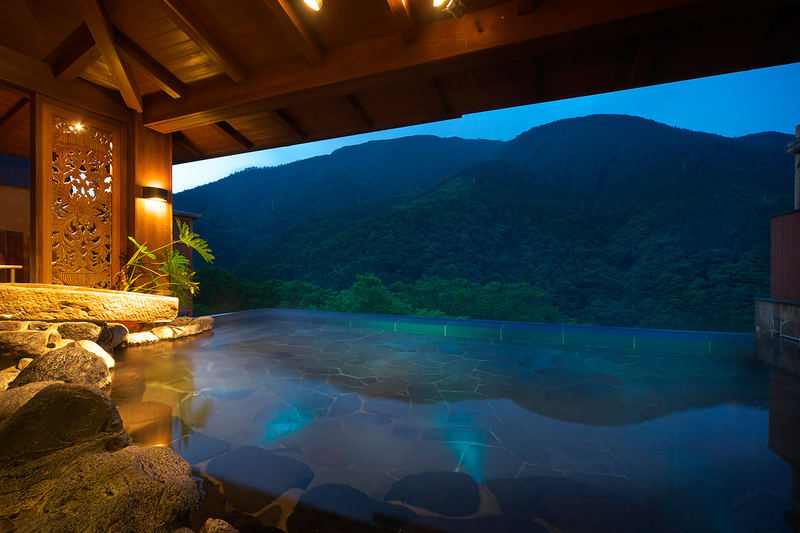 Hakone Ginyu is a South East Asian inspired Japanese ryokan, perched on the steep slope of the Haya River Valley. 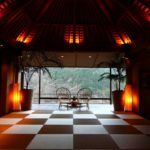 It is a more modern ryokan: whilst offering the traditional tatami flooring and futon bedding, there is still a perceptible sense of modernity and luxury in the property’s sumptuous design. As you walk in, you are met with two high-backed whicker chairs, which look out over a beautiful view of the surrounding mountains. 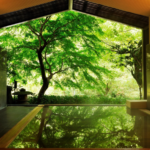 The view is breathtaking, and indicative of the calming, serene stay that awaits guests at Ginyu. 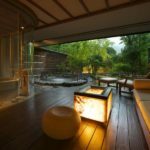 Huge windows opening on to the lushly forested ravine, private open-air hot springs in every room, and impeccable service make the Ginyu one of Hakone’s – and indeed, Japan’s – finest ryokan. 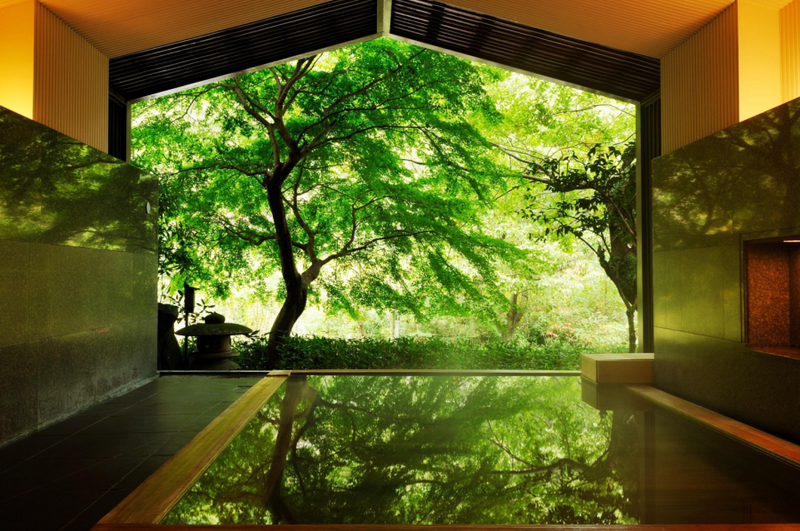 Hakone Ginyu seamlessly blends traditional Japanese elements with modern touches, creating a feel that is part resort, part ryokan, and all luxury. 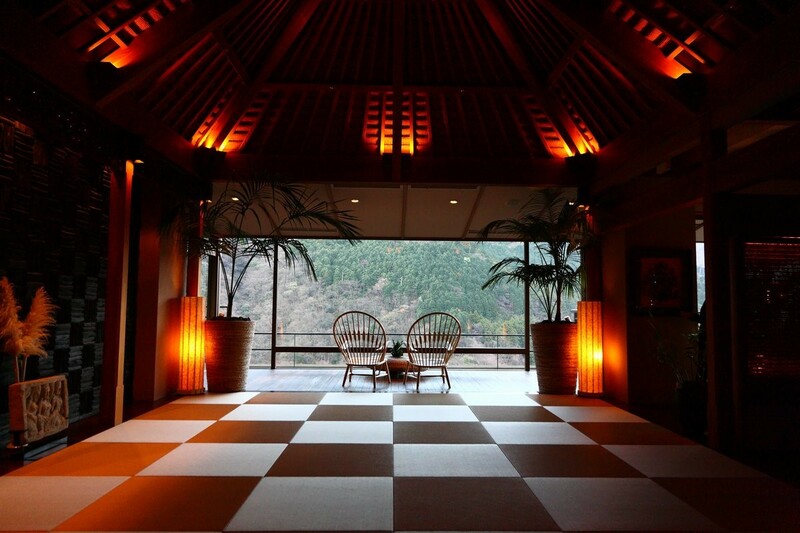 Balinese influences in the lobby and lounge make it immediately obvious that the Hakone Ginyu is designed for relaxation. The resort aesthetic reaches into the bar, where you can sip drinks while watching the ever-changing scenery. The large, communal, hot springs baths are also designed to highlight the Ginyu’s unforgettable view, and the infinity pool baths are unrivaled in any season. Guests have a choice of Japanese or resort style suites, to please those who prefer the traditional Japanese experience as well as those who feel more comfortable in a bed. Both are exemplary. The traditional Japanese rooms boast separate dining areas featuring a sunken table that allows guests to stretch their legs during the elaborate kaiseki meals – an unforgettable tasting menu of fresh, seasonal, and often local Japanese and fusion cuisine. Resort style rooms that fuse Zen with Indonesian elements and western furniture are the height of comfort for those wanting something more familiar. 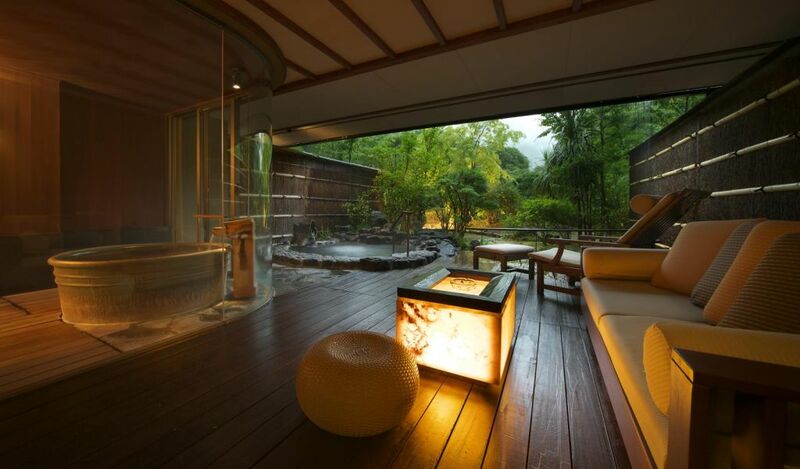 All of the Ginyu’s rooms open onto the valley, and each room features a private open-air onsen bath either on the terrace or in a secluded Japanese garden. Into Japan Specialist Tours are delighted to be able to include a night or two at the Hakone Ginyu as part of your tailor made tour to Japan.